Researchers at USC, JPL and Tel Aviv University have managed to transfer 2.56 terabits of information by multiplexing 8 x 300Gbps "twisted" streams of visible light into a single beam. The feat exploits a phenomenon which, up until recently, scientists thought may have been impossible to achieve with light: orbital angular momentum (OAM). OAM, the way a wave can be made to twist around itself, is what makes the team's discovery particularly exciting. It also makes their findings incredibly useful for wireless data transmission. 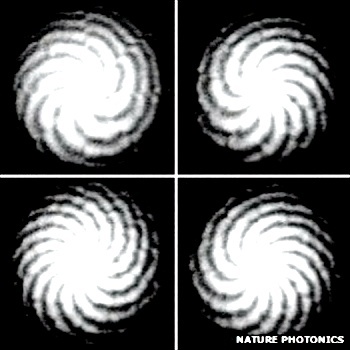 Making light beams spiral to create an optical vortex is not necessarily a new idea, but putting that phenomenon to work for the transmitting information is something researchers have been striving for. Currently, existing wireless technologies (i.e. radio waves) employ SAM (spin angular momentum) but not OAM. SAM differs from OAM in the same way that the Earth's spin differs from its orbit around our Sun -- imagine SAM as a spinning planet and think of OAM as the orbit of that spinning planet as it travels around a star. Just as the rotational speed of SAM can be used to represent different numbers (i.e. data represented by the number of spins per second), the tightness of spirals produced by OAM can also represent numbers (faster the twist, tighter the spiral). Ultimately, researchers have managed to simultaneously utilize both SAM and OAM to represent data with light, giving them tremendous potential to represent huge ranges of information and deliver it at light speed. Despite the amazing potential of their findings, there do exist complications. For one, researchers only managed to transmit data across one meter of distance. Regardless, the team believes it can achieve similar results using links over 1km in length. Additionally, because the beams are made entirely of visible light, such light vortices require clear line-of-sight between the sender and recipient. This means you most likely won't be replacing your Wi-Fi network with a wireless phase-modulating vortex beam station anytime soon. There's also the matter of turbulence or otherwise less-than-perfect conditions for the medium in which the light passes through (i.e. the atmosphere). As a result, researchers suggested that communication between satellites may represent an ideal scenario, but there's much work to be done on producing hardware and software capable of managing light-based OAM. Previous research does suggest such beams could be contained within fiber optic cabling, but we already have plenty of room to grow there as it is. The real excitement seems to be transmitting data wirelessly, an area where our future endeavors may be limited by the finite amount of usable radio spectrum available. Leveraging light-based OAM could potentially provide an immediate solution to this problem. The full paper can be found at Nature (only the abstract is free), but ExtremeTech provides a great look into their findings.